Showbread have been described as the Nine Inch Nails of the Christian music scene by some critics. "I'll agree to a certain extent," said singer Josh Dies (it's Porter on his birth certificate, by the way). "If you take elements from every NIN record and fuse them with Refused, you'd have Showbread. I think because our last record was so dark and had a lot of straightforward industrial in it people thought, 'Industrial equals Nine Inch Nails.' A lot of Showbread fans don't listen to industrial music, so that's the connection they make." Dies isn't upset about that, though, adding, "That record was heavily influenced by Nine Inch Nails, but it was also influenced by God Lives Underwater, KMFDM, Marilyn Manson, Stabbing Westward, too. We aren't trying to create a 'Christian' substitute for any secular band, but we love Nine Inch Nails and we've always been pretty open about aping their music. At the same time, we make no bones about being Christians and that our faith is the defining attribute of our music, band and lives. So if someone says we're the Christian Nine Inch Nails, I'd say awesome." For the new album, the band once again worked with Sylvia Massy, perhaps best known for her work with Tool during their early days. "Working with Sylvia is a dream come true for Showbread," Dies said. "Ever since we did 'No Sir, Nihilism Is Not Practical' with her and Rich Veltrop in 2004, we knew we were in the perfect recording atmosphere for our band." Any time Showbread have tried to work with anyone else, they can't seem to "find the same magic, and recording becomes a struggle. 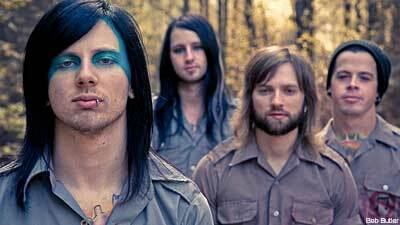 I don't think Showbread will ever do another record with anyone else, if we have anything to say about it," Dies said. Dies is also in the middle of working on his seminary degree and his second novel, making him a very busy man who laughs at flatulence. "My brother and I are developing a screenplay and a comic book script, while [guitarist] Mike [Jensen] is struggling with the decision to adhere to his wife's request to start taking Gas-x. On the one hand, his wife will finally have some peace; on the other, life will become a little less hilarious without constantly farting. I am very serious."